Nestled in the foothills of Himalayas, SGRR public school Race Course was established in 1986. 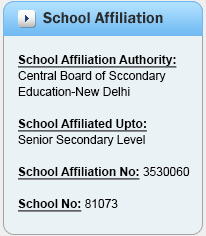 It is affiliated to Central Board of Secondary Education(CBSE). The school is managed by Shri Guru Ram Rai Education Mission whose parent body is Darbar Shri Guru Ram Rai Ji Maharaj. The first and foremost priority of SGRR Race Course is pursuit of excellence in academics. Extra and Co Curricular activities is a regular feature in school that keeps child’s potential in resonance with curriculam development. Products of this school are enjoying good position in all streams for example in Army Services, Medical, Engineering, Information Technology etc. The school has been making sincere efforts since last 28 years blossoming its inmates by ensuring all round development in their personalities by providing them opportunities for unfolding their inner potentialities by creating opportunities for their participation in multifarious intra and inter school activities. More stress is given to groom the students into good human being by inculcating good values in them Thus keeping the banner "Work is Worship" soaring high.